On June 1, 1956, the New York Times broke a story that captured the imagination of the world. Another Dead Sea Scroll had been found, unlike any before it, describing unimaginable treasures worth untold billions buried in the hills east of Jerusalem and under the Holy City itself. In the years that followed, scholars came to believe that THE COPPER SCROLL COULD BE HISTORY S GREATEST TREASURE MAP, one that could not only lead to the treasures but pave the way to the building of the Third Jewish Temple. But the scroll s code has never been broken, and experts from all sides warn that any effort by Israel to rebuild their Temple in Jerusalem would unleash a war of biblical proportions. 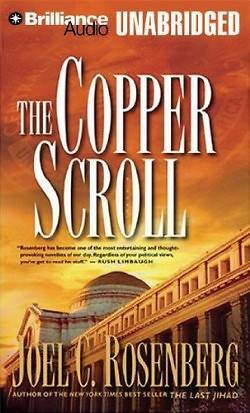 Now, exactly fifty years after the Copper Scroll was unveiled, New York Times bestselling author Joel C. Rosenberg takes you on his most exciting and heart-pounding ride yet. SADDAM HUSSEIN IS GONE. YASSER ARAFAT IS DEAD. A NEW IRAQ IS RISING. Now White House advisors Jon Bennett and Erin McCoy find themselves facing a terrifying new threat triggered by an ancient mystery."